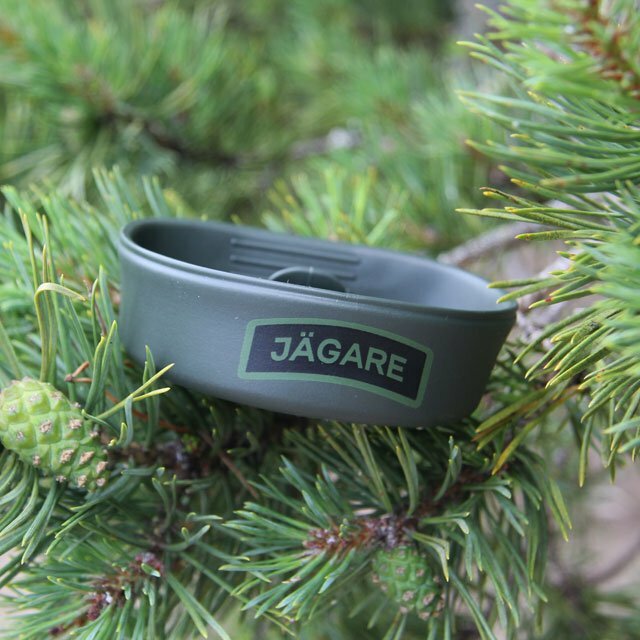 On this OD lightweight folding cup (from the known manufacturer to the Swedish Armed Forces) we have chosen to add the text Jägare in yellow and black and the result is a cup that stands out among others. The folding cup as an item is a military issued cup and used frequently in the Swedish Armed Forces. It is considered an honor to receive a units folding cup as token gift and this green/Jägare one will enhance this unofficial standpoint tenfold! Now you can enjoy this formidable product that makes you easily grab a cuppa in the deep green forest, snow filled vistas or directly scoop up water from the cold springs in the treeless Laponia! Found in almost every Swedish soldiers uniform pocket.. if not they should drop and give you ten on the spot! Note! Because of print this cup should not be washed in high temperature industrial dishwashers! If you want to preserve the cups print for a long time we recommend hand wash. Unfolded it holds 2 dl +. Size: L - 9 cm x W - 7 x H - 2,8 cm folded and 5 cm unfolded. Your cart is empty, but doesn't have to be..